The Irish News must pay £25,000 plus court costs to a west Belfast Italian restaurant owner after a jury found a food critic's review to be defamatory. Journalist Caroline Workman's August 2000 review criticised the quality of food and drink, the staff and the smoky atmosphere in the Kennedy Way premises. Owner Ciarnan Convery claimed the article was a "hatchet job". The newspaper pleaded justification and fair comment. It will appeal the jury's unanimous defamation verdict. Mr Convery's legal team claimed at Belfast High Court that the review was defamatory, damaging and hurtful and said the Irish News has failed to apologise or print a retraction. Mr Convery, a former taxi driver who opened the restaurant in 1991, said he was delighted at the ruling. "I think justice has been done. Goodfellas is a successful business and today's verdict has proved to me, my staff and my customers that we did the right thing by launching the libel action." 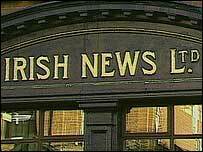 An Irish News spokesman said the verdict raised "profound questions involving the freedom of the press. "We firmly believe that newspapers must have the right to publish fair and honestly written reviews, contributed by experts in their particular field and engaging in either praise or criticism when it is justified," he said. "We are convinced that a public interest issue of the utmost importance is at stake here, and we have therefore instructed our lawyers to enter an immediate appeal."